Much has been made of the Rim Fire being one of California's largest "on record," and the biggest burn yet seen in the Sierra Nevada. But it depends on what record you're looking at. Scientists are finding that in the not-too-distant past -- we're not talking Jurassic here -- forest fires burned far more real estate than they typically do today, and more often. The difference is that the forests bounced back much more readily. 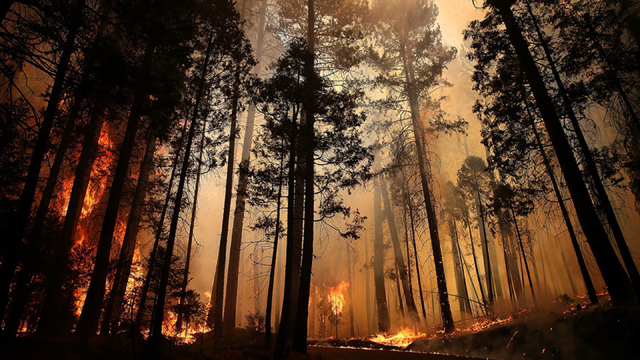 A century of forest management practices, combined with hotter and longer summers brought on by climate change, have set the stage for more catastrophic fires. But "big" didn't always mean catastrophic. 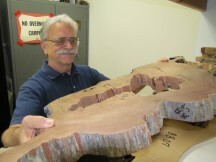 For 25 years, Carl Skinner and his colleagues at the U.S. Forest Service have been building a kind of "pre-history" of fire in California by scrutinizing tree rings. The shelves of his lab near Redding are piled high with crosscut slabs of big sugar pines and other trees from northern California forests. "We find 1822 fires all over the place," Skinner told me while sorting through wooden slabs. "It was a very dry year. 1729 is another one. There’s a number of these very pronounced drought years that give us an idea of what to expect in a year like this." 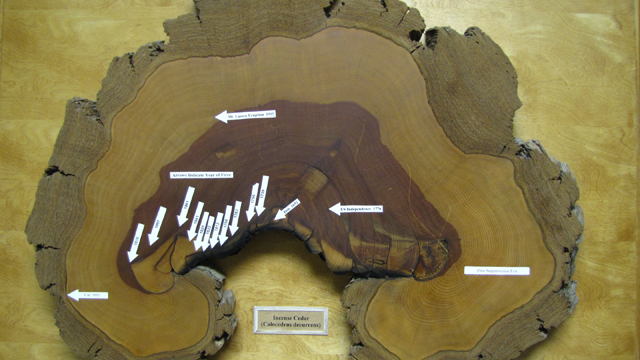 Skinner pointed to intermittent black marks within the tree rings. "The areas here are scars, where the fire came along and killed a very small section of the tree right here, and then this is the healing where the tree tries to heal over," he observed. "And then a few years later another fire came and then it heals, and then a few years later another fire." Tracking backward in time, from the outside in, something surprising emerges. Fire was an integral part of the landscape -- and there was a lot of it, caused primarily by lightning strikes. "Every 8-to-12 years, they were putting scars on the trees and some places even much more frequently than that," he explained. "What this did was to clean out a lot of the understory, keep it low and have the forest, instead of being pretty dense like it is today, it’d be much more open in general, but kind of patchy." What that meant was that fires could roar through a forest and stay low to the ground, without "crowning," that is climbing and burning the big trees, as we just saw with the Rim Fire. And so a couple of hundred years ago, before there were people bent on putting out fires, forest fires were both bigger and more frequent. "Typical years would have had somewhere between 5 million acres to 12 million acres burn before we began fire suppression," said Skinner. "Since fire suppression, it’s far below that." The Rim Fire has already consumed more than a quarter-million acres by itself, but nowadays a million acres total is a very nasty fire season. "So that means we’re storing up a lot of vegetation, which is there to burn." Fuel isn't the only thing feeding bigger fires. Most scientists agree that the warming climate is, too, and may already be setting the stage for more intense events. "Fire seasons are lengthening," says Skinner, who cites research that shows them starting earlier in the spring and lasting longer. "Basically what that does is creates a longer period for drying in the summer, makes more fuel available and much more period of time in the year that you can have a fire, so your probability of having a fire just goes up with that." Skinner says that throughout the West, the fire season is running about a month longer than even 30 or 40 years ago. That means not just more potential for catastrophic fires, but also a narrower window to do "prescribed burns" in the off-season, when foresters light fires intentionally to clear out some of the fuel languishing in the forest understory. This process can't start until the arrival of enough rain to keep things from getting out of control. But there's a narrow window, because fire managers have to conduct the burns before winter sets in. Skinner has seen that window shrinking since the 1970s, when those first rains might have arrived as soon as September in the northern forests of California. Now, he said, the prescribed fire season might not start until late-October. "(Climate change) is actually, we think, playing havoc with a lot of the prescribed fire program," he said. "Because of the lengthening fire season, it’s squashing down the prescribed fire period before it becomes too wet in the winter." The Forest Service and Cal Fire got lucky last year, with an unexpectedly light fire season. But Skinner has learned that luck is a kind of two-edged sword. It means that more fuel is accumulating, waiting for the next big burn. Meanwhile Cal Fire has floated a new plan that would reduce fuels on an additional 216,000 acres per year on average, using a combination of burning, logging, targeted grazing and herbicides. The use of herbicides has invited controversy but prescribed burns have been controversial, too. And according to research by the U.S. Geological Survey, outlined in this video, how well it works depends on where it's done.